Preview events offer only brief glimpses of big games. Who knows how any given game will pan out in its final form? The most we can say is This Could Be Good. Once producer Robin Hunicke explained the serious themes underneath Wattam’s cuddly exterior, the game made more sense. Keita Takahashi’s latest work is as indescribable as anything else the Katamari Damacy creator has brought to life, but beyond the bright colors and dancing poop, it’s about celebrating our differences and bringing people together to overcome adversity. That’s the thing about Wattam: Its themes are a deeply laid foundation for all the playfulness built on top, bringing all of its offbeat ideas together without getting in the way of the silliness. Like the best family-friendly works, it’s capable of both unbridled joy and valuable introspection and moves swiftly between the two. The adversity in this case is surprisingly dire. Long ago, a black-hole monster attacked the Earth—which is also a queen and has limbs and a face because everything in Wattam has limbs and a face. Just as the monster’s tongue is about to pull her into its nasty lamprey mouth, the queen sets off a bomb under her crown and sends her pieces flying into space. Many years later, the Mayor wakes up on one of those scattered pieces, seemingly alone, but he soon notices a cloud napping above him (and raining drool onto his bowler hat). That cloud is going to be your new friend, the first of many to come. So you climb a tree, grab its hand, and wake it up. That’s when the fun begins. 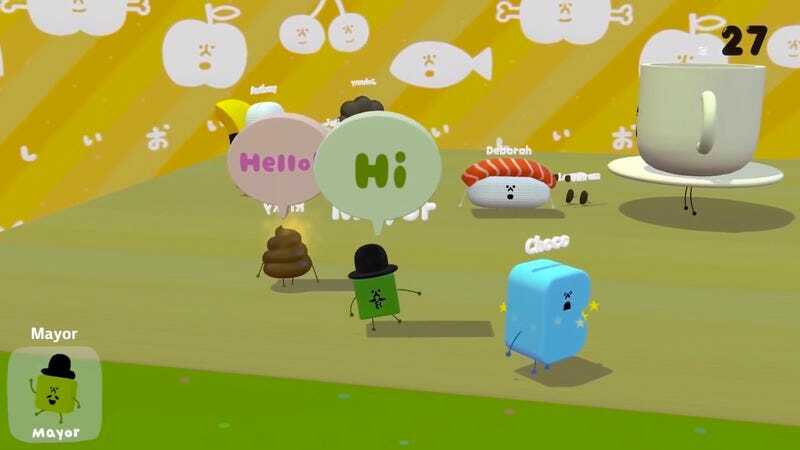 Wattam sits somewhere between the wacky toy boxes of Takahashi’s Noby Noby Boy and the more traditional level-based structure of Katamari Damacy. The idea is to bring the planet back together by finding and connecting its people, but there’s no pressure to do much of anything besides take control of all the cute characters and see what happens when you use their unique abilities on the world and on those around them. Once you’ve made enough friends, you gather them together to hold hands or stack into a wobbling totem pole and set off the bomb under the mayor’s hat. Everyone gets blown into the sun (which also has a face, of course), and because that explosive experience was so fun, a new piece of the planet—essentially, the game’s next level or playset—happily shows up with new friends to play with and discover. Some people are harder to connect with than others. Late in the demo, I was introduced to the tragic tale of a pillow who’d grown up lonely and friendless (told through one of the game’s delightful, and more often hilarious than depressing, hand-drawn cutscenes). Everyone who touched it fell asleep instantly, so it was my job to find characters who could hold the pillow’s hands and withstand its sleep-inducing powers. The answer was a pair of tiny coffee beans. With their “coffee buzz” power, the pillow perked up for good, finally free to hold hands in my merry band of misfits. Takahashi’s playtime with his 2-year-old son inspired Wattam, and that childish imagination is ultimately what drives it. All the characters—whether they’re jetpack-equipped sushi or lawn mowers—have a wind-up toy look, but they move like kids running with their bellies out and arms flailing. The animation is so charming that I would often stop what I was doing to hold hands with a bunch of friends and just drag them around to see their little stick arms flop around behind them. The bliss of youth also informs the theme of connection. Kids don’t care about segregating their toys by type or brand. When it’s playtime, the toy chest gets emptied out, and everything comes together. It’s probable that watching a video of Wattam or reading a preview like this one won’t do much to help you understand it. I was still dumbfounded after playing it for at least the first five minutes. Looking back at my half hour with it, though, I realize there isn’t much to understand. The whole point is to let your guard down and embrace the world around you with the faith that something great might happen.